In stock -This product will ship today if ordered within the next 9 hours and 47 minutes. 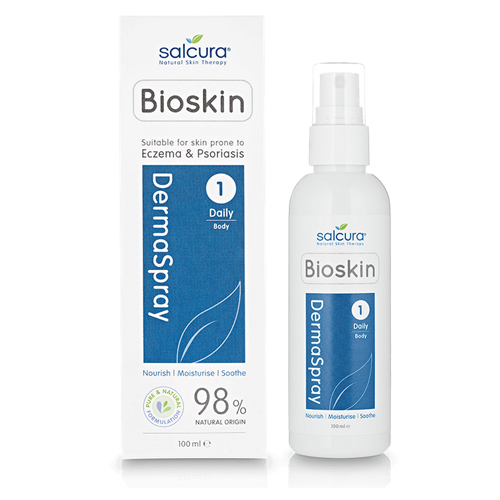 Salcura DermaSpray has a proven track record and is Salcura`s most effective and practical solution for skin conditions. Salcura are so confident you`ll love it they offer a 30 day money back guarantee. See below for details. Salcura DermaSpray Skin Nourishment Spray is both innovative and unique. Developed specifically for adults and children over 12 years of age with dry, itchy skin. It combines an effective steroid and chemical free, nutrient rich formulation with a hassle free spray on application. Providing rapid itch relief, the fine liquid sinks deep into the skin to nourish skin cells earlier on in their life cycle - making them healthier when then are at the surface and so far less likely to display symptoms associated with serious conditions. A spray application can also be far more practical and economical than a cream. It can easily be used when spots occur in the hair-line/scalp. Atomising the liquid through a spray head means little wastage, minimal liquid use and an even coverage over the skin. Aqua**, Glycerin*, Sunflower Oil (Helianthus Annuus Seed Oil**), Safflower Oil (Carthamus Tinctorius Seed Oil**), Glycol Stearate Se, Cetearyl Glucoside, Sodium Cetearyl Sulfate, Phenoxyethanol, Lecithin, Grape Vine Oil (Vitis Vinifera Seed Oil**), Sea Buckthorn Oil (Hippophae Rhamnoides Kernel Extract**), Isononyl Isononanoate, Eucalyptus Oil (Eucalyptus Globulus Leaf Oil), Paperbark Tea Tree Oil (Melaleuca Alternifolia Leaf Oil), Urea*, Orange Oil (Citrus Aurantium Dulcis Peel Oil Expressed**), Ethylhexylglycerin, Caprylyl Glycol, Sodium Chloride, Lavenda Oil (Lavandula Angustifolia Oil**), Rosemary Oil (Rosmarinus Officinalis Leaf Oil**), Olive Oil (Olea Europaea Fruit Oil**), Almond Oil (Prunus Amygdalus Dulcis Oil**), Cetearyl Alcohol*, Peppermint Oil (Mentha Piperita Oil), Aloe Vera (Aloe Barbadensis Leaf Juice Powder**), Beta-Carotene, Rosemary Extract (Rosmarinus Officinalis Leaf Extract**), Limonene*, Linalool**. Suitable for children from 12 years of age and adults with dry and sensitive skin. 2. Apply at least 3-4 times a day initially onto the skin. 3. Once skin feels moisturised and nourished reduce application frequency. 4. Continue using DermaSpray as and when required to supply the skin with vital moisturisers and nutrients helping ongoing skin comfort. 5. When applying to the face and around the eyes, we suggest spraying onto a cotton pad when wiping onto the skin to give control over the spray action and to avoid contact with eyes. Avoid contact with eyes. Stop using DermaSpray if you experience any discomfort. 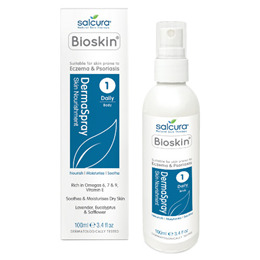 Below are reviews of Salcura Bioskin Dermaspray - 100ml by bodykind customers. If you have tried this product we'd love to hear what you think so please leave a review.